Estense "Gran Riserva" balsamico is barrel-aged not less than 12 years. Estense balsamic originates from "Gran Riserva" casks at the Fattoria Estense farm in Modena, Italy, one of Italy's finest producers of balsamic vinegars. You will find Estense balsamico to be creamy, sweet/tart, & dense. The rich, full, intense flavor of this balsamico will definitely have you coming back for more! Drizzle over meats, salad greens, grilled or steamed vegetables, aged cheeses, fresh strawberries & fruits....simply enjoy. 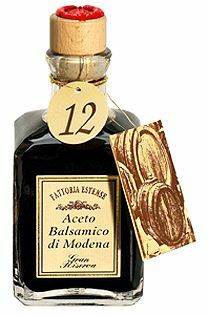 Fattoria Estense Gran Riserva Aceto Balsamico di Modena 12 Yr. AGED NOT LESS THAN 12 YEARS.